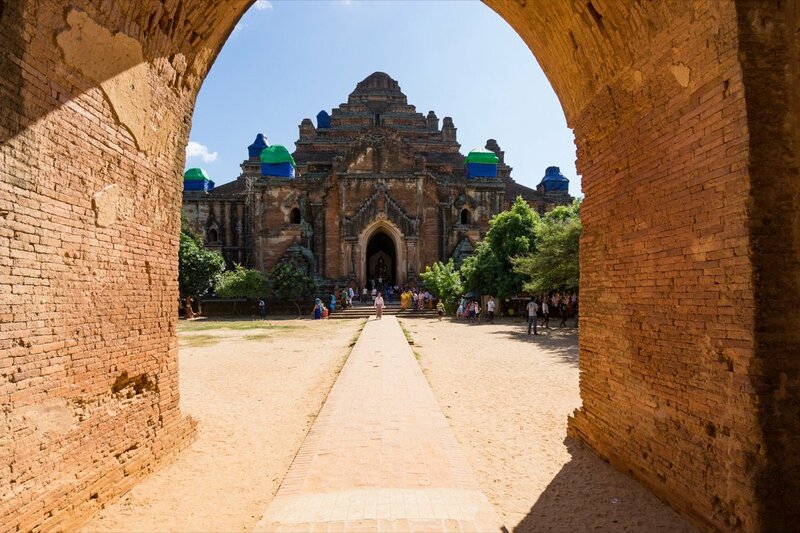 How much time do you need to see Bagan? 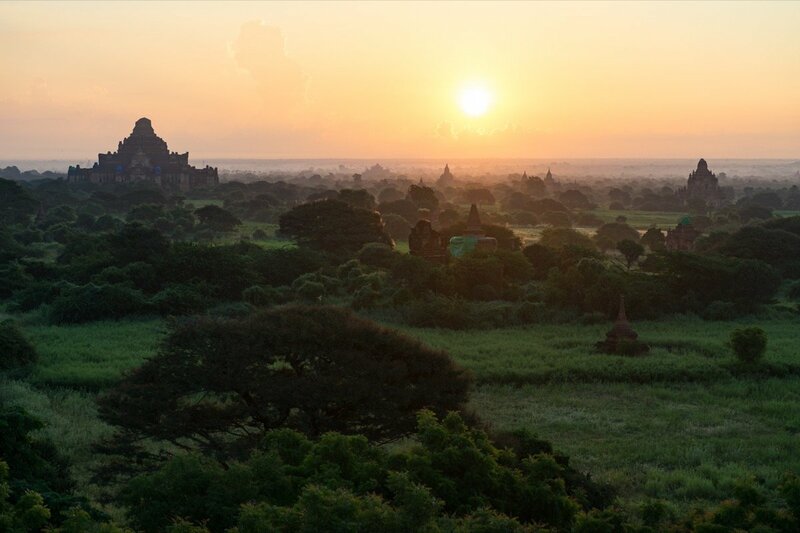 Here is everything you need to know for your stay in Bagan, including the best places to watch the sunrise and sunset! Bagan is the highlight of any trip to Myanmar. 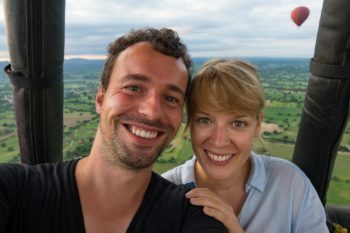 We actually met a couple in Myanmar who skipped Bagan on their trip. They thought it was too touristy and so they opted for Mrauk U instead. What a mistake! Mrauk U is very pretty too, but there’s no comparison with Bagan. Sure, a lot of tourists go to Bagan. But the area is huge too, and we almost never had the feeling there were too many people there. Nevertheless, Bagan can be a bit overwhelming at first. 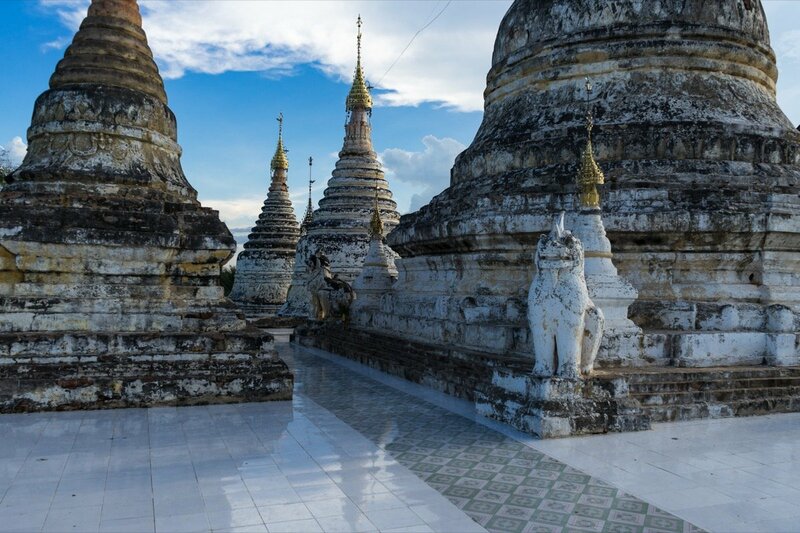 After all, it boasts around 2,000 temples and pagodas just waiting to be explored. It’s easy to lose track when you’re so spoiled for choice. We’ve written this post to make sure that doesn’t happen to you. We want to provide you with all the information you’ll need for your trip to Bagan. And to keep everything clear and simple, we’ve structured it neatly with a table of contents. Choosing the most beautiful out of 2,000 temples isn’t an easy task. But of course some of the temples and pagodas in Bagan are particularly impressive. We want to introduce them to you. Of course we’re not implying that the other temples are any less beautiful. It’s definitely worth going on a discovery tour of your own and looking for smaller temples that not everyone visits. 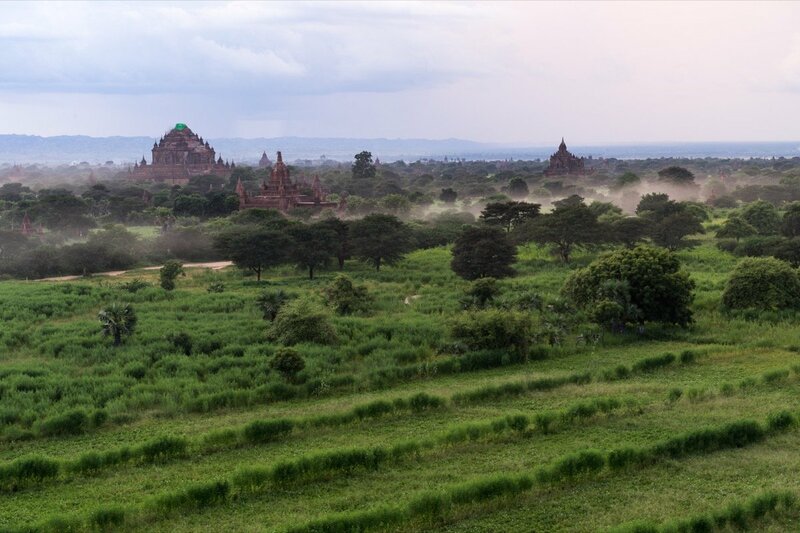 The archaeological site of Bagan and the distances between the various sights are pretty vast. 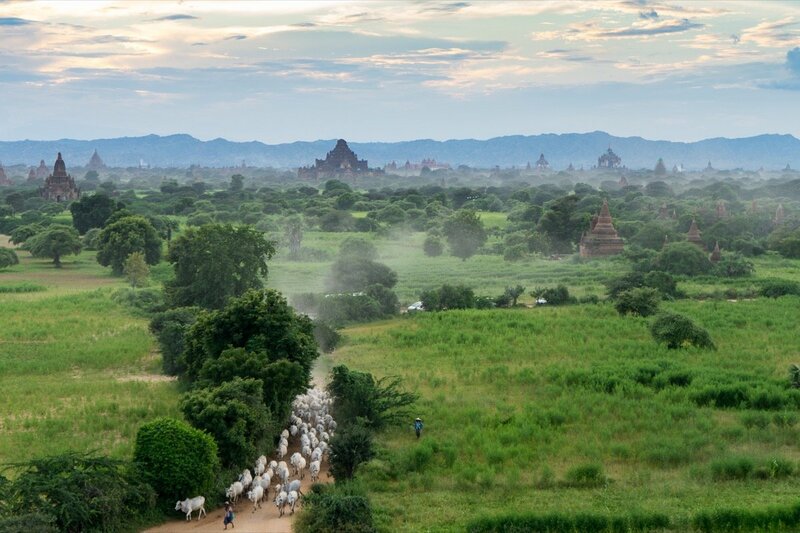 We recommend hiring an e-bike to explore Bagan (see below for more information). There are three small towns arranged in the form of a triangle around the pagoda field. There’s Nyaung U in the northeast, Old Bagan in the northwest, and New Bagan in the southwest. They’re connected by a fairly serviceable road running around the pagoda field. You can find hotels in all three locations, but we recommend staying in Nyaung U. You can find more information about accommodations in the “Where to stay” section below. We’ve sorted the temples according to the area they’re in so you can use our handy little temple list when you’re there. If you like, you can just visit the temples in the order listed here. But of course you don’t have to. On the route from Nyaung U to Old Bagan, one highlight chases the next. The Htilominlo Temple is located about halfway between Nyaung U and Old Bagan. Our tip: There are four entrances to the temple. If you take the exit on the western side and walk past the souvenir stands, you’ll see a small, flat pagoda. You can climb up onto its roof for the best view of the Htilominlo Temple. The Dhammayangyi is the largest temple complex in Bagan, but not the tallest. You can already see the colossal building from a distance. That’s one temple that definitely isn’t going to win any beauty pageants. But the twin sitting Buddhas inside are fascinating. It’s highly unusual for two Buddha statues to be sitting side by side, and no one really knows what they’re doing here. 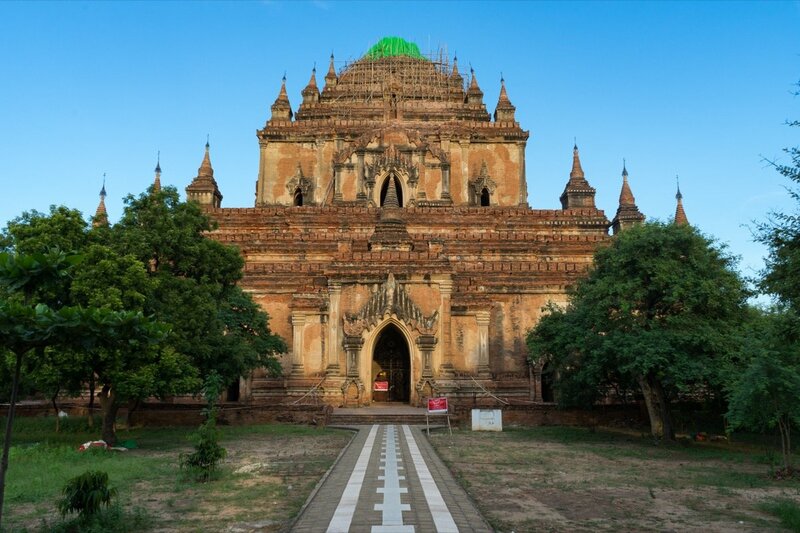 The Sulamani Temple used to be one of the most impressive monuments in Bagan. Unfortunately, it was hit hardest of all by the earthquake in August 2016. The entire top of the temple has collapsed onto itself, so unfortunately it’s lost a lot of its splendor. 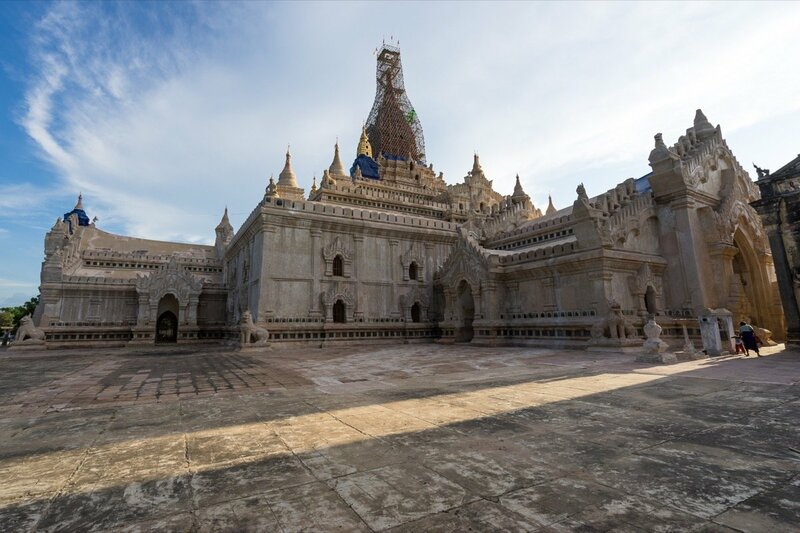 The Ananda Temple, located just outside of Old Bagan, is one of the largest and most beautiful temples in Bagan, both inside and out. The facade has recently been refurbished and the characteristic golden tip was just being restored while we were there, so it was hidden behind rickety bamboo scaffolding. 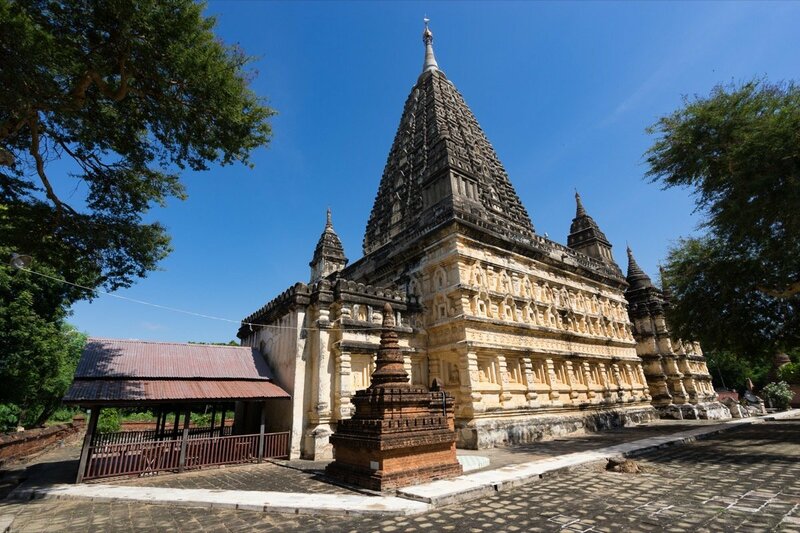 The small Hsu Taung Pyi Pagoda is located behind the Ananda Temple to the north. No one seems to be taking much care of this pagoda, but it actually looks really pretty. 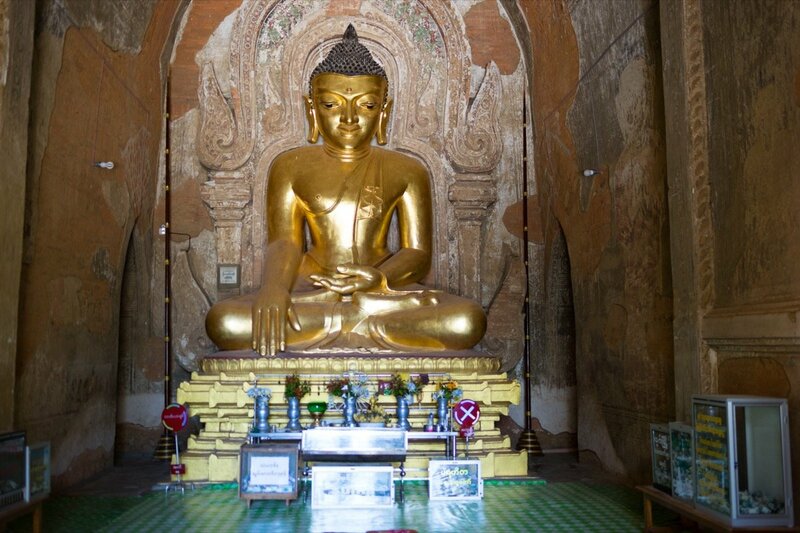 The Minochantha Pagoda is one of our favorite places in Bagan. 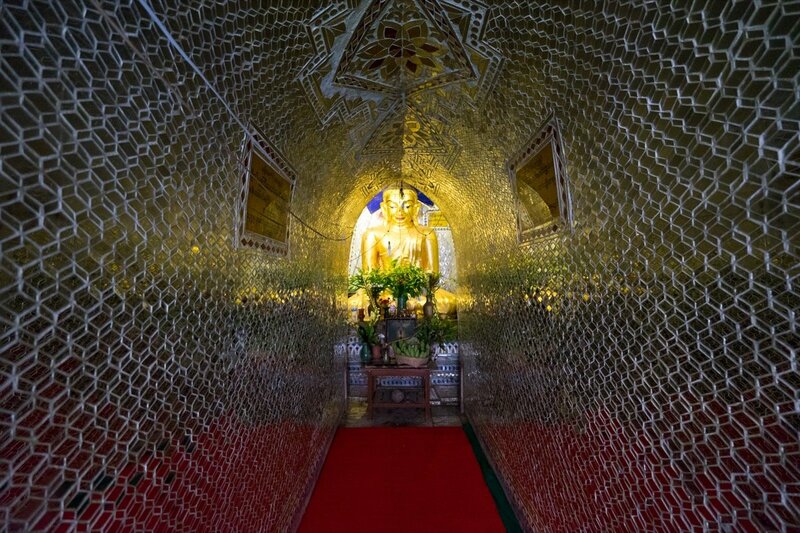 This pagoda isn’t on your average tourist’s itinerary. At first glance, it isn’t even all that spectacular, but we felt that it exuded an incredible serenity and beauty. The pagoda is located just behind the Hsu Taung Pyi Pagoda, which you’ll find behind the Ananda Temple. 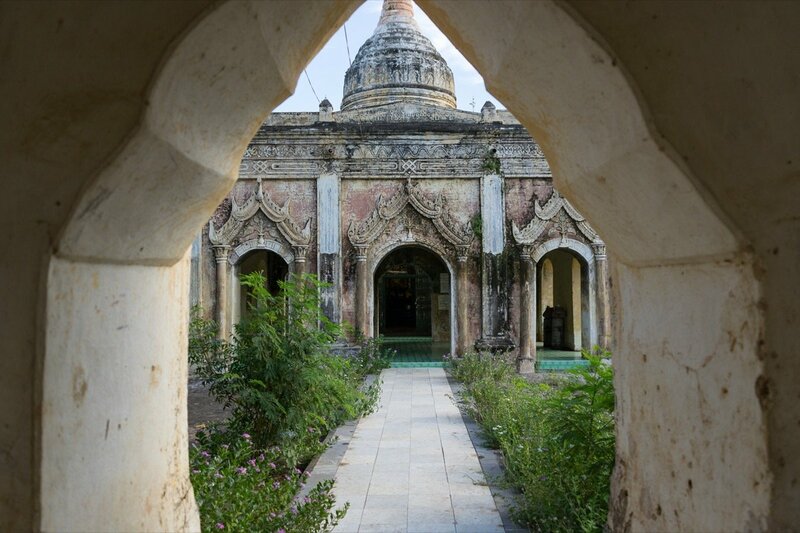 The Bupaya Pagoda is located at the north end of Old Bagan, right on the banks of the Irrawaddy River. Incidentally, Bupaya means ‘gourd’, and when you see the pagoda, you’ll know how it got its name. The Gawdawpalin is a beautiful temple in the middle of Old Bagan. 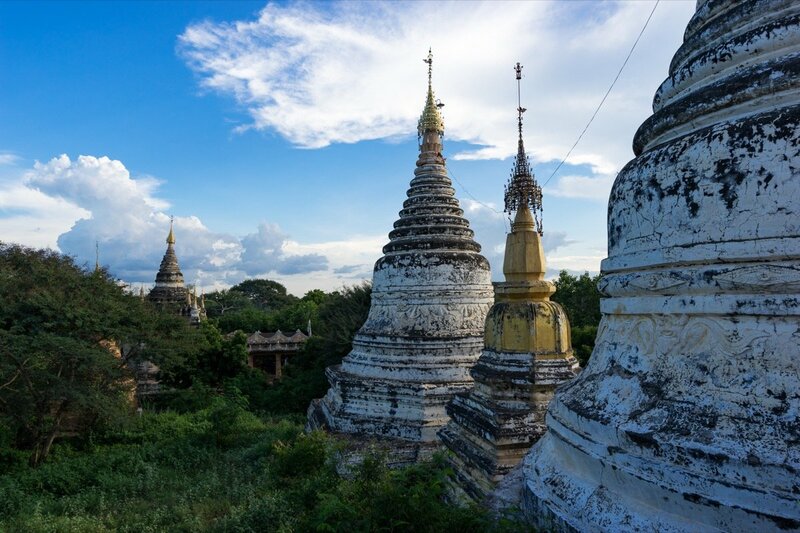 Our tip: There’s a small, unimpressive pagoda next to the Gawdawpalin Temple. You can climb a flight of steps on the inside, which gives you a wonderful view of the Gawdawpalin. When you leave the Gawdawpalin through the main entrance, turn right and then turn right again. On the left-hand side of the road you’ll see the little pagoda. 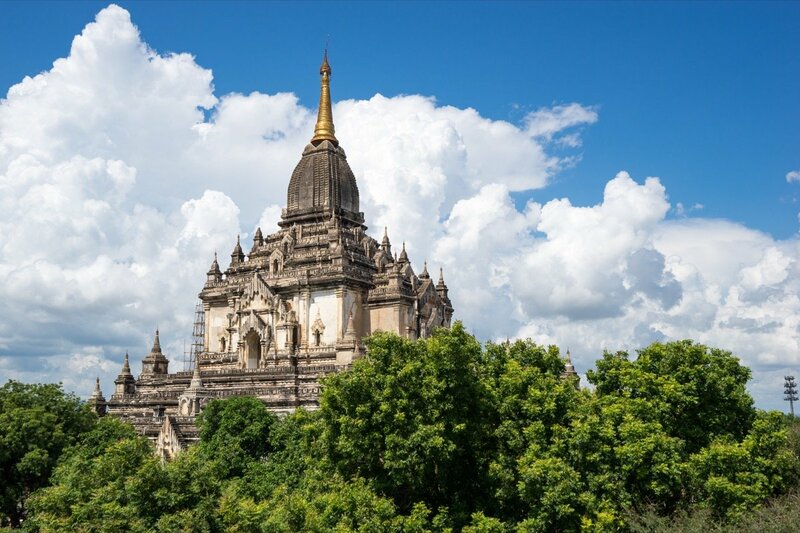 The Mahabodhi Temple is very different from the other temples in Bagan. The temple is a copy of the famous Mahabodhi Temple in India and absolutely worth seeing. The Shwegugyi Temple is particularly interesting because you can climb it for an amazing view of the surrounding temples. It provides a particularly good vantage point for taking pictures of the nearby Thatbyinnyu Temple. 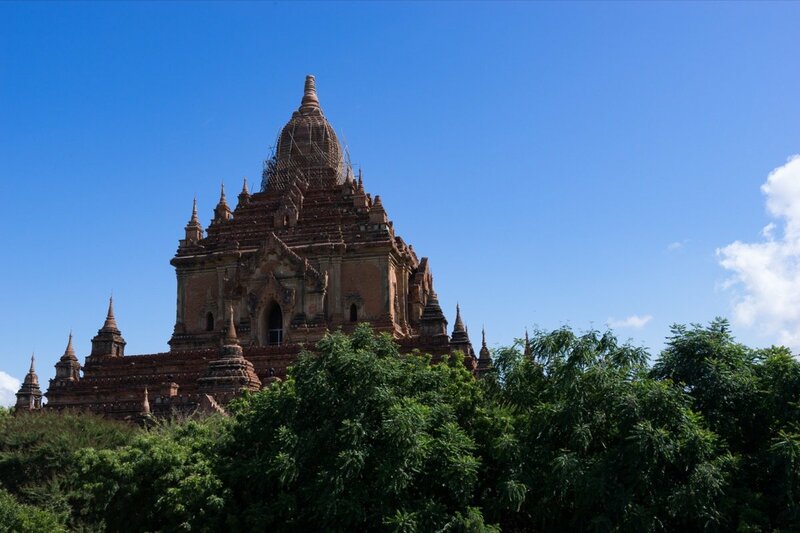 The Thatbyinnyu is the tallest building in Bagan at 61 meters and can be seen from far away. However, the inside of the temple isn’t particularly spectacular. 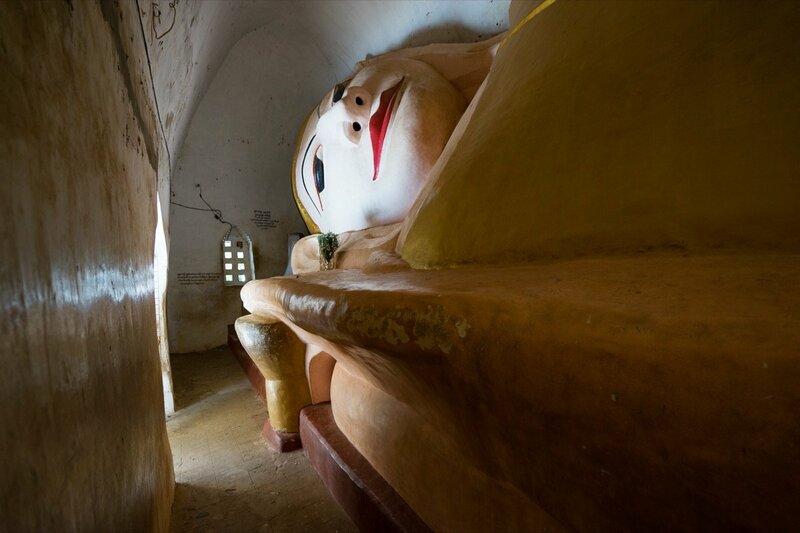 The Manuha Temple is definitely the craziest temple we’ve seen in Bagan. Apparently the builders thought they had to fill their rooms with as much Buddha as possible and so there are huge Buddha statues inside taking up almost the entire space. There are three Buddhas in the front room and a huge reclining Buddha at the back of the temple. Manuha Temple – Taking pictures here is a real challenge because there’s only about a meter of space in front of the Buddha. Manuha Temple – The reclining Buddha doesn’t have much more breathing room either. The first time we saw the Dhammayazika was from up above. Our hot-air balloon ride took us directly over the temple, and so of course we wanted to see what it looked like from the ground. The Dhammayazika is located way down south, only just within the Nyaung U town limits, so not that many people venture down that far. But it’s definitely worth a visit! 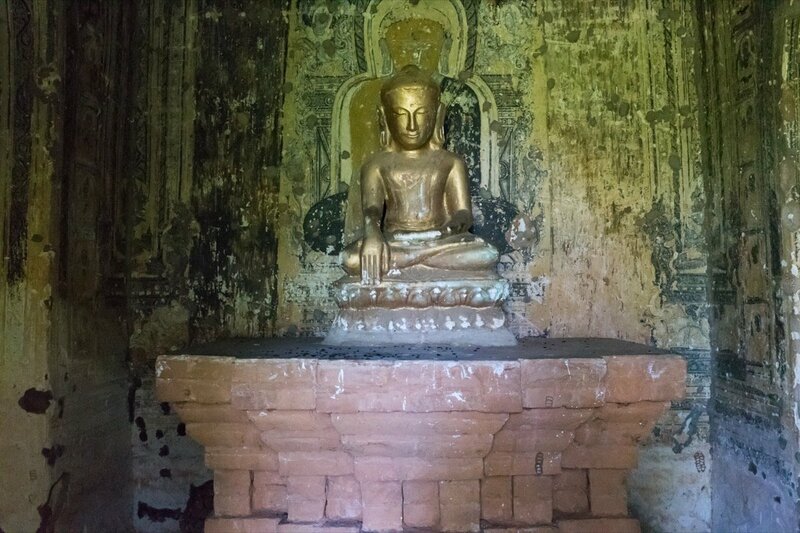 The Lemyethna is one of the less-visited temples along the road from New Bagan to Nyaung U. 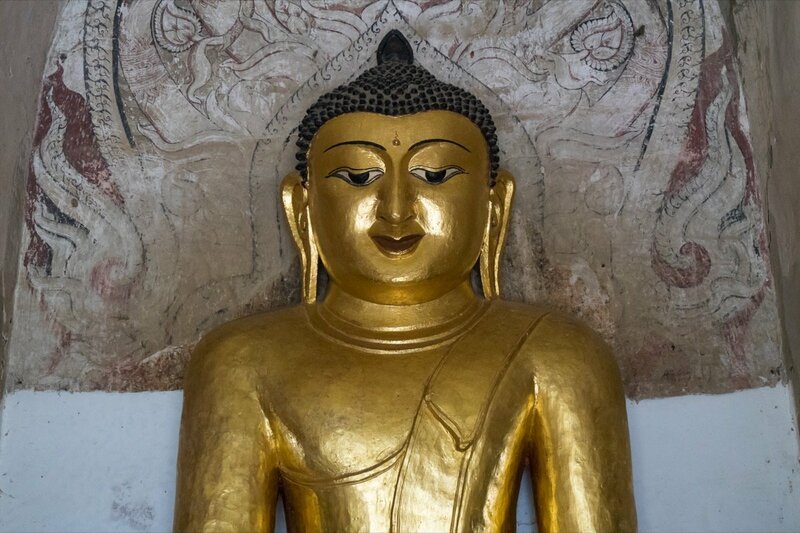 But its interior is very worthwhile with its Buddha statues and well-preserved wall drawings. The Payathonzu temple doesn’t look like much at first glance, but it actually has a lot to offer. 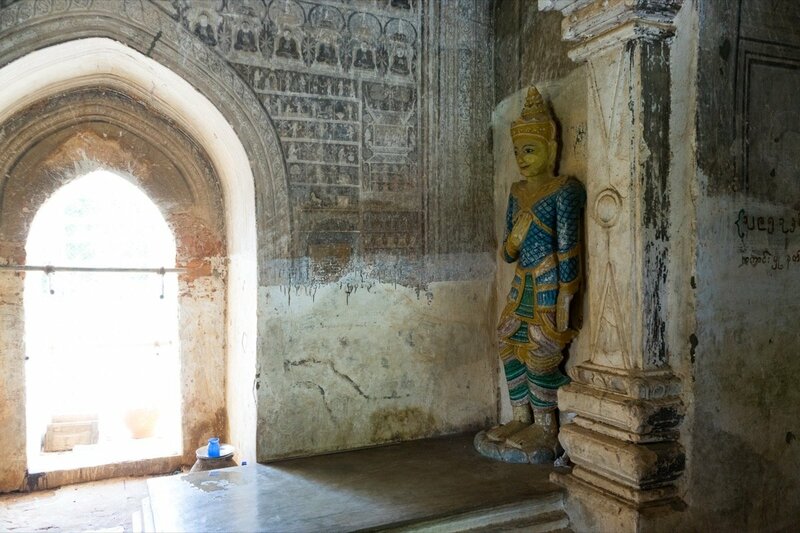 Inside are some of the most beautiful and detailed murals in Bagan. Unfortunately, taking pictures is prohibited in the Payathonzu, so we can’t show it to you in all its splendor – you’ll just have to take our word for it. Tip: If you turn the left in front of the Payathonzu, after a few meters you should see a small pagoda that also has very pretty murals. And you can take pictures there, so we’ve just posted a photo from that pagoda for you instead. 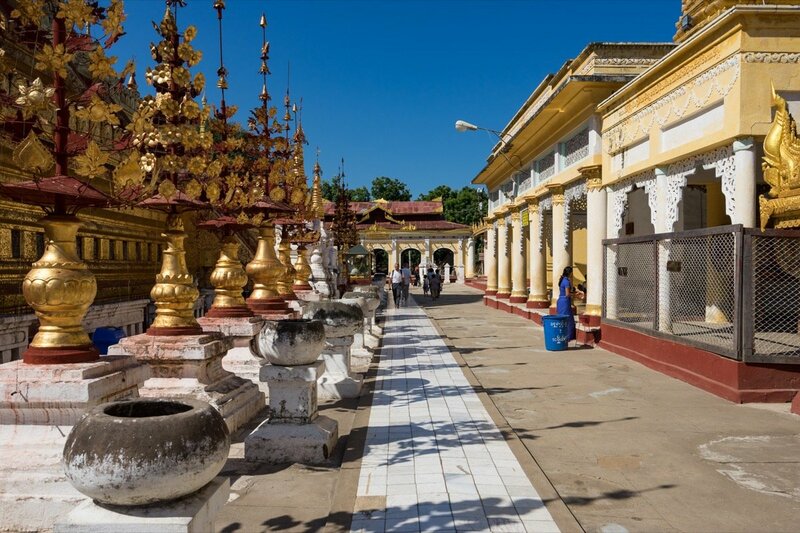 Nyaung U also has a pagoda within its town limits and it’s definitely one of the highlights of Bagan: the Shwezigon Pagoda. It’s completely covered in gold and richly ornamented. When we visited, the tip was surrounded by scaffolding, but that didn’t make the pagoda any less impressive. Our tip: If you see a cluster of people staring at the ground, grab your camera and get over there, stat. 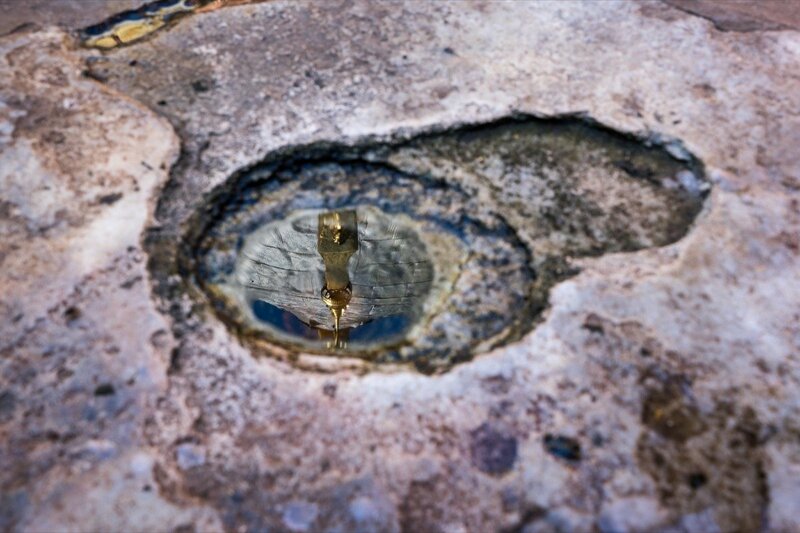 They’ve probably spotted a small puddle reflecting the tip of the pagoda. That’ll definitely make for a great picture! 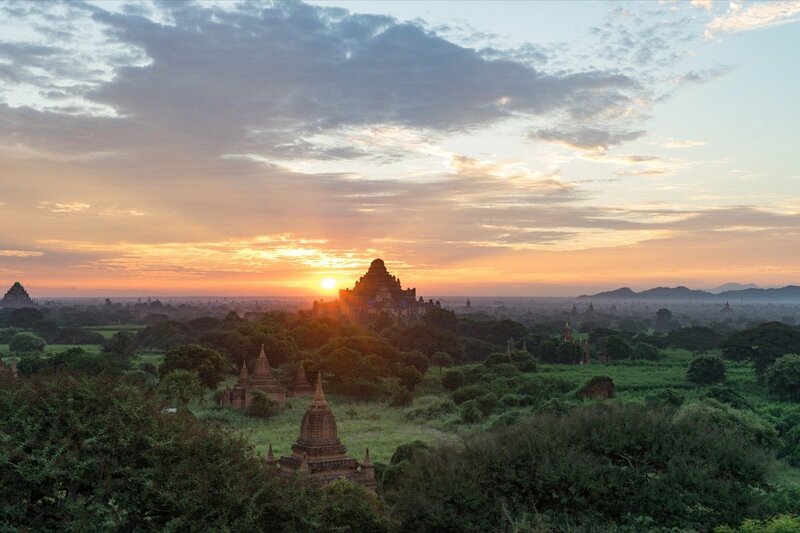 No matter who you ask which is the best temple to watch the sunrise or sunset in Bagan, their first answer will always be: Shwesandaw! 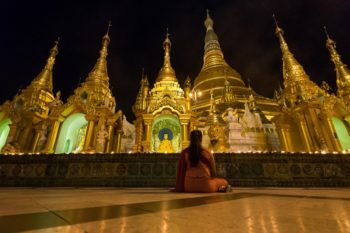 You can climb the Shwesandaw Pagoda via the steep flight of stairs on the outside, and the three platforms leading around the pagoda provide a great view in all directions. No wonder that the Shwesandaw Pagoda is so heavily frequented both sunrise and at sunset. And when we say heavily frequented, we’re not exaggerating. Tourist groups are carted in by the busload and throng to the temple to get the best view. Even at sunrise you’ll still encounter hundreds of other visitors there. We were there at lest half an hour before sunrise and the upper platform was already fully occupied. So if you want to set up your tripod in the best position, you should get there very, very early. Then again, the view from the lower platforms is almost just as good. If all want to take amazing sunrise or sunset photos, then the Shwesandaw Pagoda is almost certainly the best place in Bagan. But if you want to soak in the atmosphere in peace and you can live without taking the perfect postcard photo, then we’d recommend choosing a different temple. Sunrise on the Shwesandaw Pagoda. The cameras are already in position. 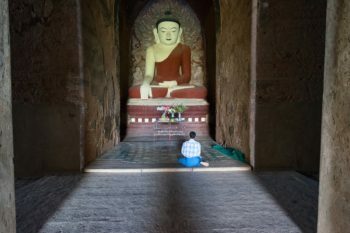 While everyone else was heading out to the watch the sunrise at the Shwesandaw Pagoda, we ventured out a bit further on our second day in Bagan and discovered the Law Ka Ou Shaung Pagoda. It’s only located a few hundred meters from the Shwesandaw Pagoda, but it’s nowhere near as crowded. Although the pagoda isn’t quite as high, it’s still worth watching the sunrise from there. 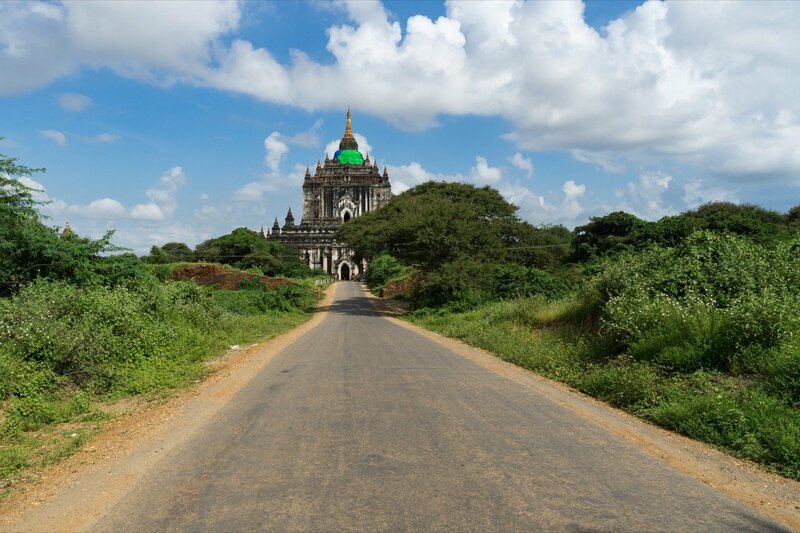 When driving on the road between Nyaung U and Old Bagan, turn off towards the Shwesandaw Pagoda, then take a right behind the Shwesandaw, and after about 200 meters you’ll have arrived at the Law Ka Ou Shaung. 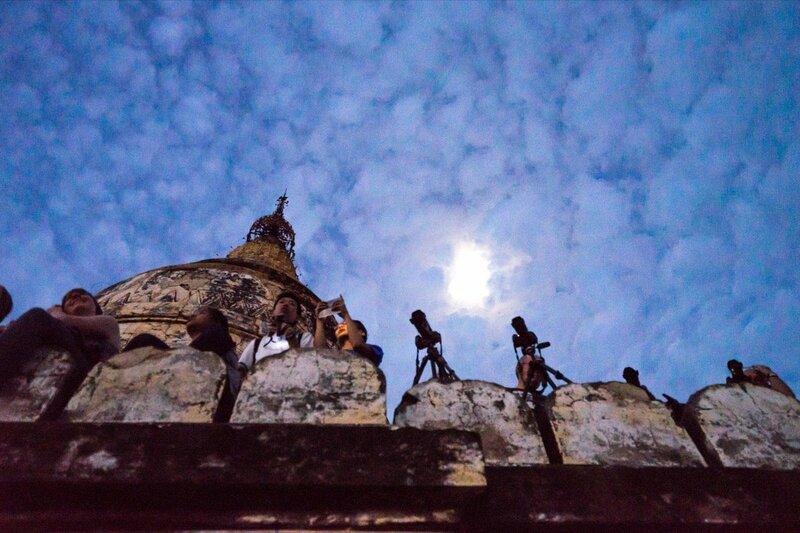 The Pyathadar is one of the most popular spots next to the Shwesandaw Pagoda for watching the sun set over Bagan. Unfortunately, it’s almost as crowded as the Shwesandaw Pagoda and this is actually the one place where we witnessed a traffic jam in Bagan. The small sandy roads just aren’t designed for 50 buses and minivans heading for the same place at the same time. But the view is still worthwhile and the very large observation deck is also pretty spacious. 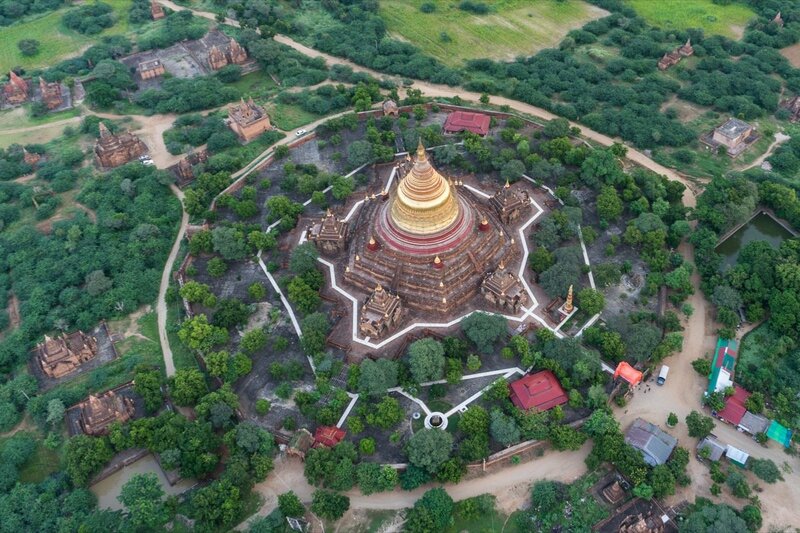 The Bulethi Pagoda on the road from Nyaung U to Old Bagan is one of the places to watch the sunrise and sunset that doesn’t get too crowded, at least not yet. Unfortunately, they’d just begun with restoration work the week we arrived in Bagan, so we couldn’t get to the top of the temple. Our tip: There’s another pagoda right next to it that you can climb too. However, there isn’t that much space up there and it can be pretty scary for people with a fear of heights. It’s not a good spot to watch the sunset though because the Bulethi Pagoda is in the way. If you’re coming from Nyaung U and heading towards Old Bagan, turn left towards Bulethi or Sulamani Temple and you’ll see a larger number of small temples on the left-hand side. Some of these temples are open to the public and offer a beautiful view of the sunset. The temples aren’t that high, but high enough for a nice view. And you have a really good chance of having a temple all to yourself there. The temples are so small they don’t even have a name. But you should be able to find them anyway. 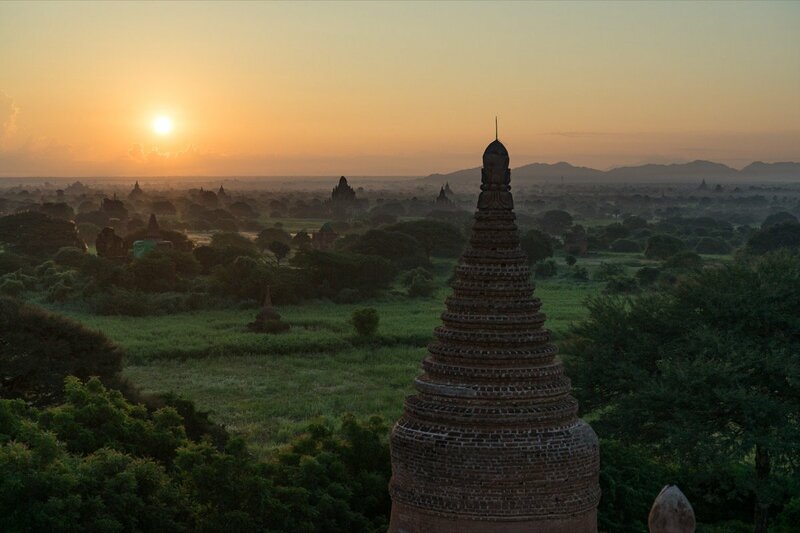 The Bupaya Pagoda in Old Bagan is also a great choice to watch the sunset because it’s located right by the river banks. 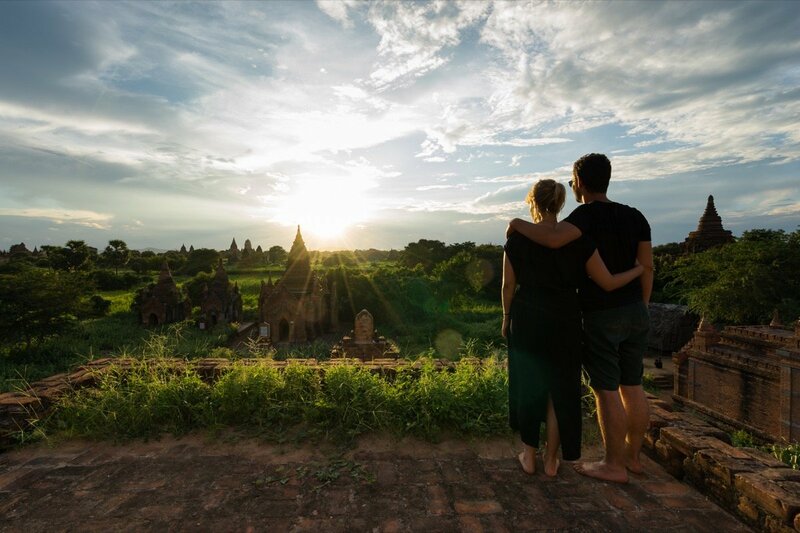 The Mee Nyein Gone Pagoda, also in Old Bagan, is another beautiful spot to take in the sunrise or the sunset. 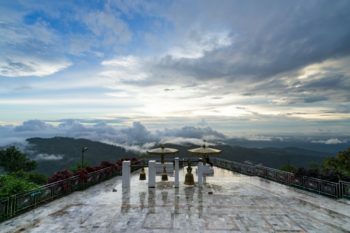 The Oak Kyaung Gyi Temple is also frequently recommended as a sunrise spot. It’s located about 500 meters to the southwest of the Htilominlo Temple. 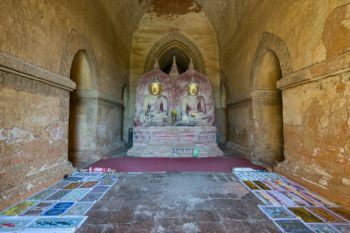 On August 24, 2016, an earthquake struck the region around Bagan and tragically damaged many of the temples and pagodas. 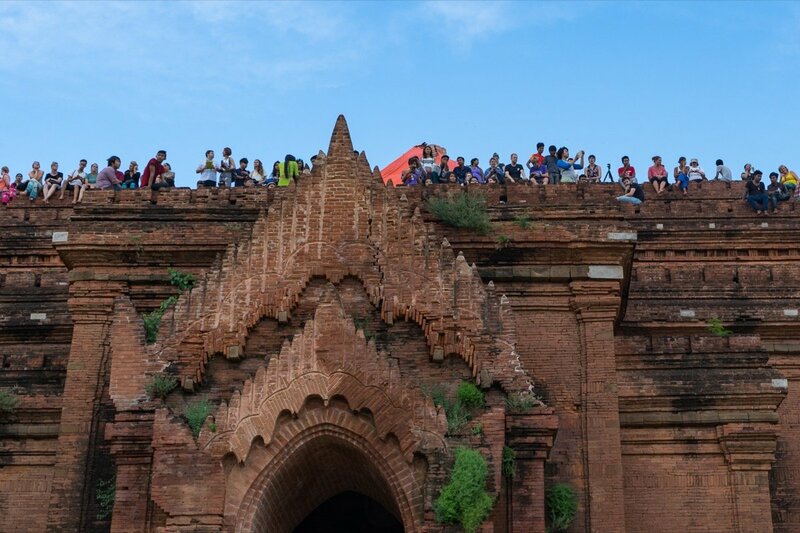 Before our trip to Bagan, we heard from many different sources that most of the temples were closed and it wasn’t possible to climb the temples at sunrise and sunset. So when we got there, we were surprised that it was mostly business as usual. The Sulamani temple was heavily damaged and is no longer open to the public. Many other temples have also sustained some damage and there’s a bit more scaffolding around the temples than usual. But there were hardly any restrictions for visitors. Almost all the temples were open for visitors to climb. So there’s really no reason to postpone your trip to Myanmar because of the earthquake. 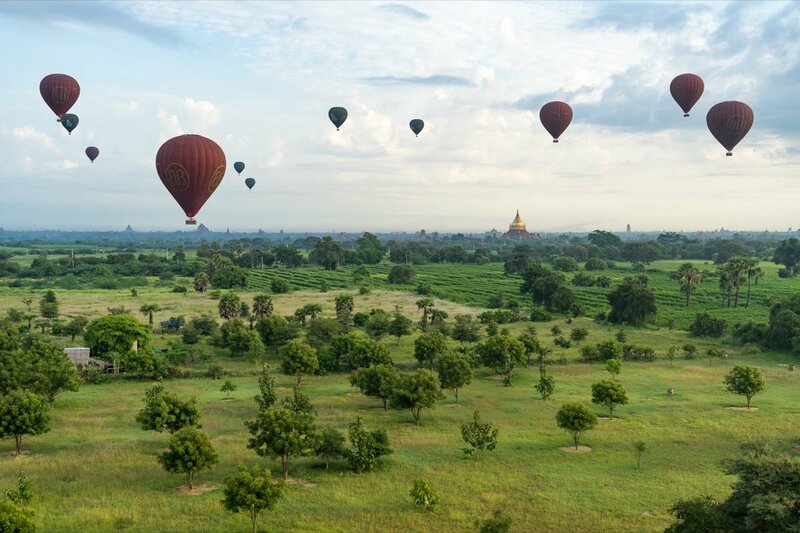 Anyone looking into traveling to Bagan has probably seen pictures of hot-air balloons flying over the pagoda field. 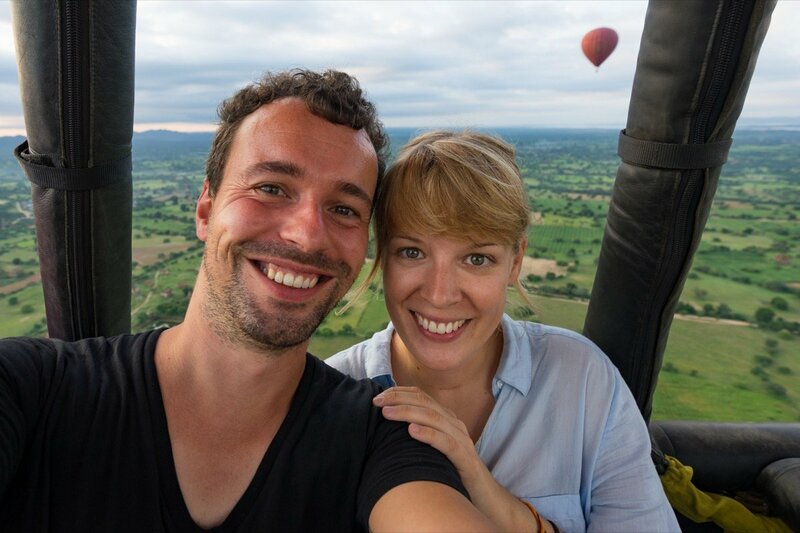 A balloon ride is definitely a very special experience and one we’ll never forget. Balloon rides are available from October to March, although quite a few rides in October get canceled due to bad weather. They’re in high demand with all three companies, so make sure to book a few weeks in advance during high season. If you get fed up with temples at some point, there are still a couple of alternative things to do nearby. 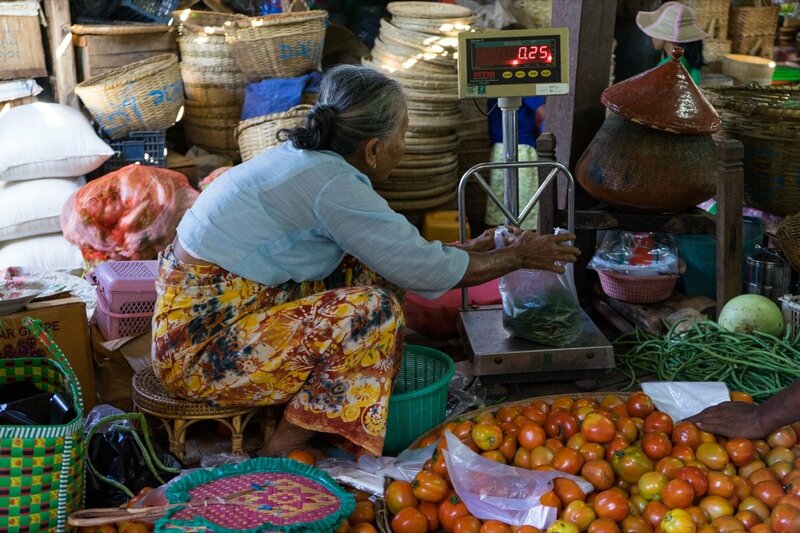 The Mani Sithu Market in Nyaung U is definitely worth a visit and a welcome change of pace to temple-hopping. 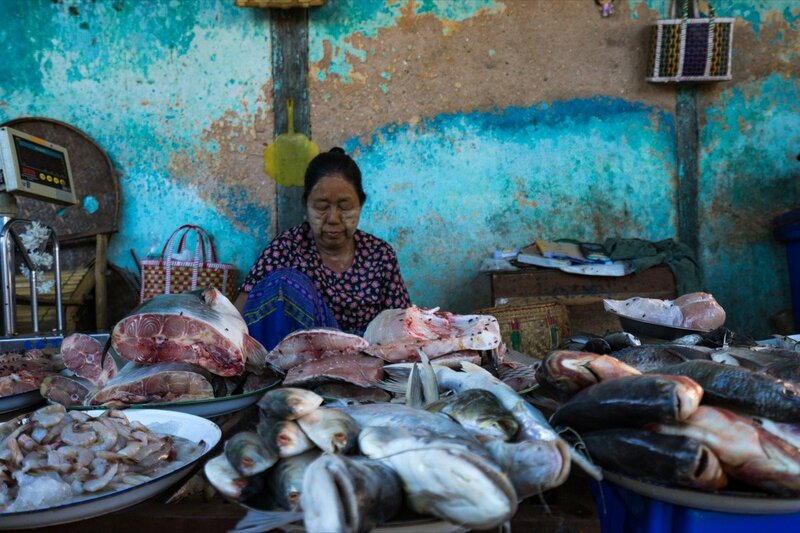 The traditional market has everything the locals need for their everyday lives: vegetables, fish, meat, betel nuts, clothing. The hustle and bustle of the market is fascinating. And there are astonishingly few tourists here. The market also features a few stalls selling cosmetics where you can get some sunscreen with a bit of luck. That’s something you desperately need in Bagan, but it’s hard to find once you’re there. 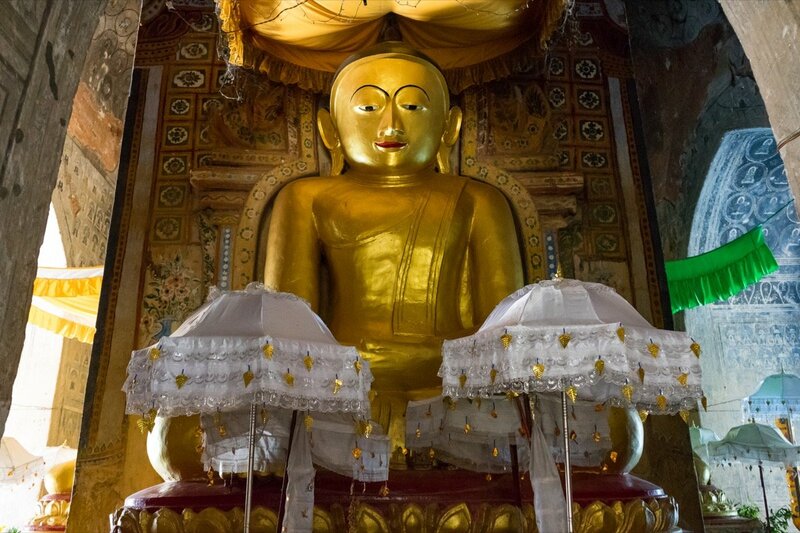 Tours to Mount Popa are offered in every travel agency in Bagan. 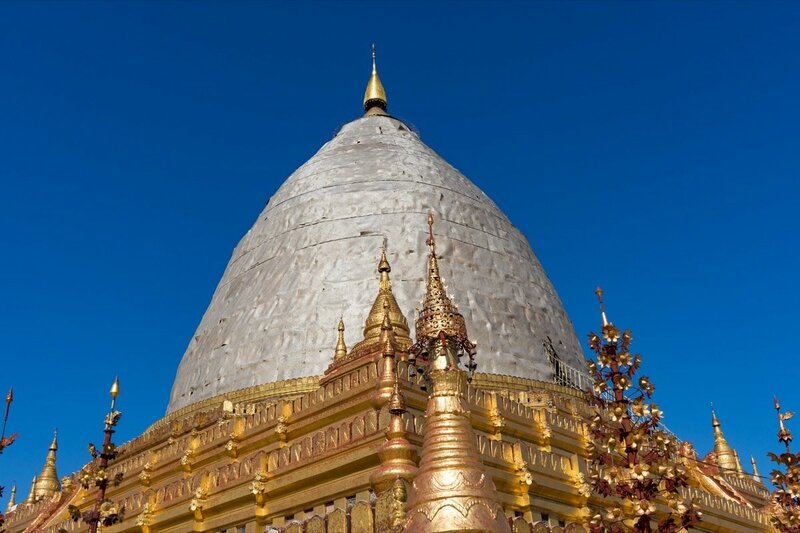 The steep 737-meter mountain with a small pagoda on the summit is an important shrine in Myanmar. 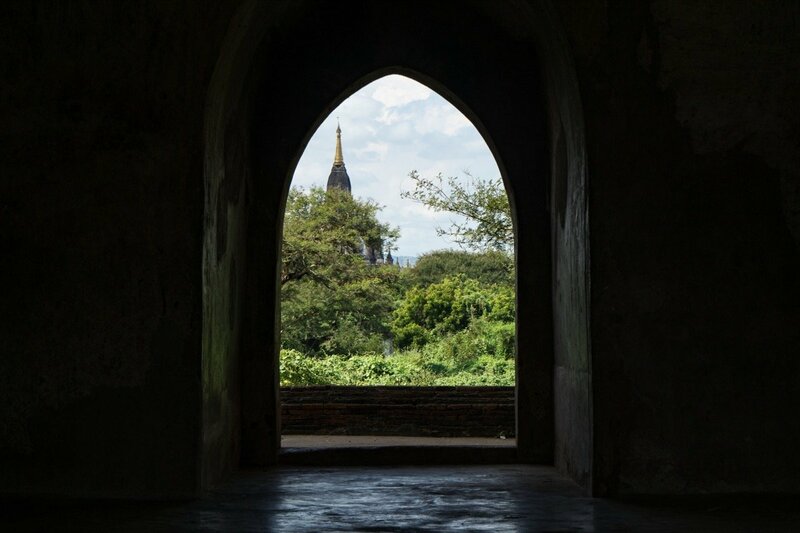 We didn’t take the trip to Mount Popa ourselves, but we spoke to some other travelers who did. They were less than enthusiastic about it. But then of course it’s really hard to compete with all the great sights in Bagan. 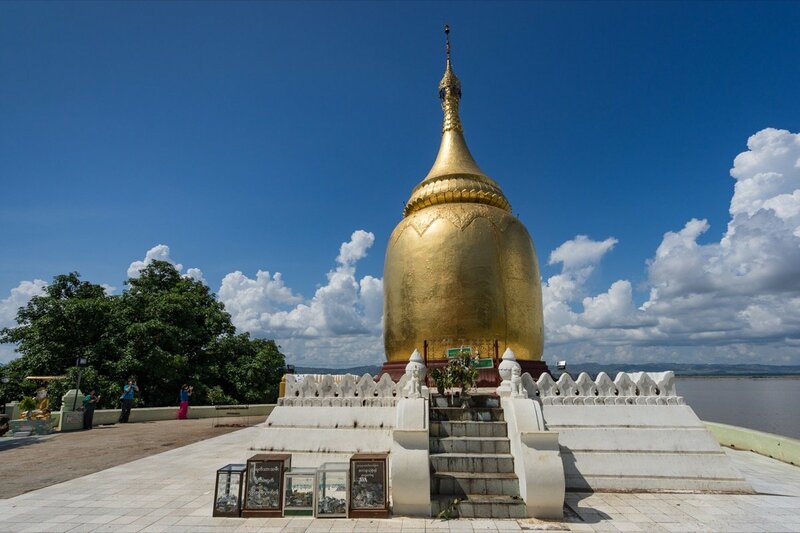 You can book a tour to Mount Popa including some other sights in the Bagan area online, here for example: Excursion to Mount Popa. Going on a boat cruise along the Irrawaddy River also makes for a welcome change. The best time for this is around sunset. There are always boatmen standing around the Bupaya Pagoda waiting for passengers. Just walk up, negotiate a price, and set off. 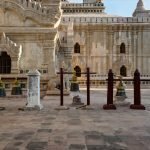 How much time should you schedule for Bagan? If in doubt, always plan a day extra! We were in Bagan for three full days (4 nights) and we think that’s the absolute minimum. We managed to see all the highlights in that time, but then we really spent a lot of time looking at temples. If you want to take a more relaxed approach, then plan a little more time. And if you want to go hunting for hidden temples or go on an excursion to the surrounding area, you should add another day or two to your itinerary. When you plan your trip to Bagan you should also be aware that you can’t spend the entire day from morning to evening touring the temples. It’s just too hot for that around lunchtime. Our daily rhythm shifted quite a bit in Bagan anyway because we got up before sunrise three times in a row. After sunrise, we went back to the hotel for breakfast and then headed straight back out. By about 1:00 pm it got too hot to bear, so we went for a bite to eat and then back to the hotel. At around 4:00 pm we headed back out to see the sunset. After dinner, we usually went to bed at around 9:00 pm. As we already mentioned, Bagan covers a vast area. Walking is out of the question. 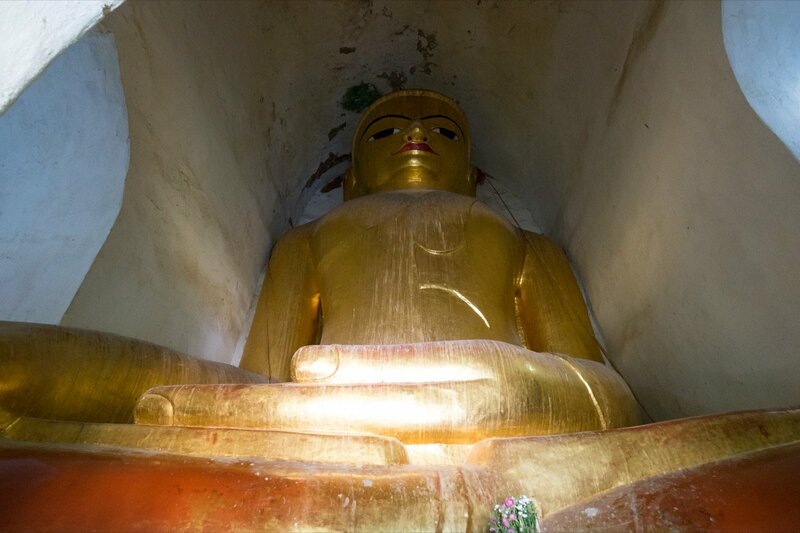 Fortunately, there are plenty of other ways to discover Bagan. Self-propulsion is definitely our preferred way of getting from A to B. Almost every hotel has a bike and e-scooter rental and if not, there’s sure to be one next door. E-scooters are pretty interesting vehicles. At first glance, they look like normal scooters, just with smaller wheels. But they’re completely electric and entirely noiseless. The scooters cost between 5,000 and 10,000 kyat per day. It’s worth test-driving a few scooters before hiring one because they all handle quite differently. We shared an e-scooter and raced around Bagan with it. If you want to get a workout while temple-hopping, you can also hire a regular bicycle for 2,000 to 3,000 kyat per day. But please keep in mind that the distances are considerable and it can get really hot. You also have to drive off-road on sandy paths to get to most of the temples. Normal mopeds are strictly off limits for tourists, by the way. So you won’t find anyone who’ll rent you one. There are still a lot of horse-drawn carriages in Bagan. 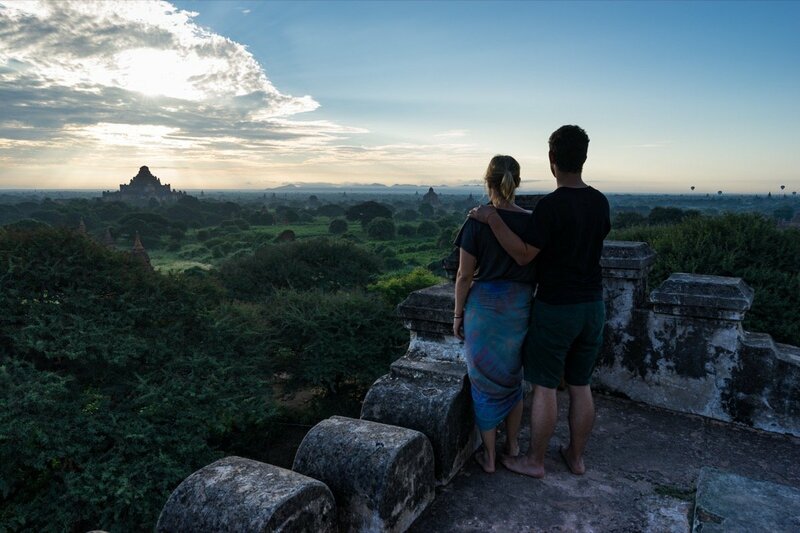 That’s definitely the most romantic and authentic way to explore the temples of Bagan, but certainly not the most comfortable. A horse and carriage costs about 20,000 kyat for a whole day, but you can also hire one for shorter distances. 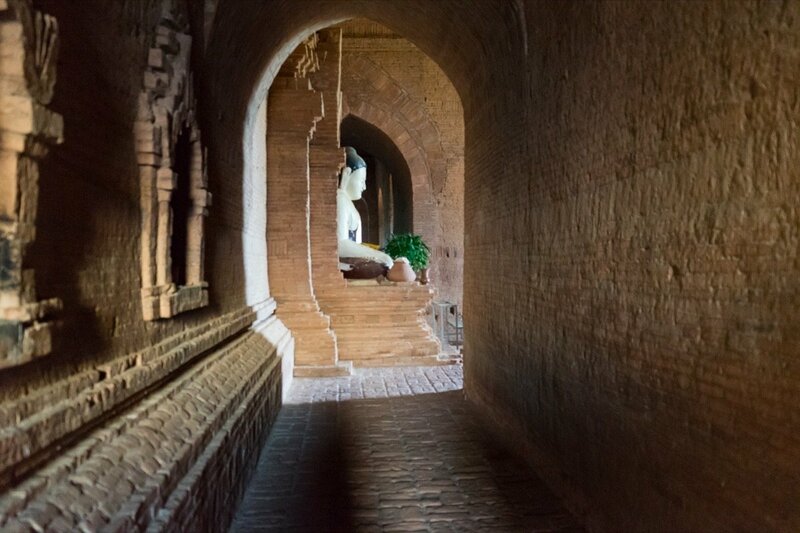 Of course you can also go on a guided tour of Bagan. It’s especially worthwhile if you don’t have much time to explore the site for yourself or if you just like having someone around to tell you a bit about the temples. The hotel landscape in Bagan is developing quickly. There are new hotels opening up every year, and they’re sorely needed. Especially in the high season, you should make sure to book ahead before traveling to Bagan unless you want to spend hours searching for a free room. Nowadays, many hotels also have a pool where you can cool off from the midday sun before heading out on another discovery tour of Bagan at sunset. Where’s the best place to stay in Bagan? Nyaung U? New Bagan? Old Bagan? When you book you’ll have to decide where you want to stay in Bagan. We stayed in Nyaung U and would recommend that you do the same. Most of the temples are centered around Nyaung U and the bus station is located nearby. Nyaang U is also the best place for restaurants and room rates there are relatively reasonable. Old Bagan is a bit more exclusive. Some of the pagodas are even within walking distance and there are some really great hotels. But you’ll also have to dig a little deeper in your pockets if you want to stay there. New Bagan is much cheaper by comparison with rooms rates similar to those in Nyaung U, but it lacks charm and is a long way away from most of the temples. Many of the tour groups stay there, and aside from the low prices, we really can’t think of a good reason to book a hotel there. We stayed at the Motel Zein and can recommend it wholeheartedly. It was definitely one of the best hotels on our Myanmar trip! Its location in Nyaung U is very good. It’s situated right by the road to Old Bagan, but it’s set back a bit so it’s very quiet. The restaurant area is 10 minutes away on foot or 3 minutes by e-bike. The rooms are new and clean, and breakfast isn’t bad either. 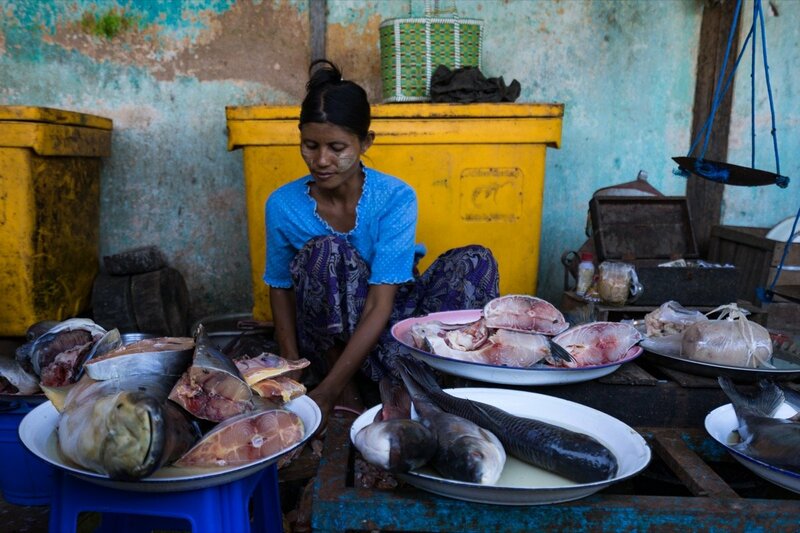 That isn’t always something you can take for granted in Myanmar. The hotel is a family business run by two sisters. Both of them spent some time studying in London, so they speak excellent English and are super-sweet. If we ever return to Bagan, we’ll definitely stay there again. There’s definitely no shortage of restaurants in Bagan. A small restaurant area has developed on Thiripyitsaya (4) Road. The huge signs already tell you that all the places serve more or less the same food: Myanmar Food, Thai Food, Indian Food, Italian Food, Western Food, Chinese Food. So everything, and in every restaurant! The quality is generally ok, but don’t expect a gourmet experience. Weather Spoon’s Restaurant is particularly popular among backpackers. We enjoyed the food there too. All those restaurant signs made us hungry for a pizza after three weeks of local food, so we gave La Pizza a try. The pizza there is nothing like the Italian original, but it wasn’t bad. There are two very delicious vegetarian restaurants behind the Ananda Temple with almost identical menus: The Moon – Be kind to animals and Yarpyi Restaurant. We don’t know who stole from whom. But they’re both very good. We’d also like to recommend a really cool project in Alt-Bagan: The Sanon Restaurant is a training restaurant for local teenagers who would usually struggle to find a good job in the region. The food and the service are outstanding and you’d be supporting a really great project by eating there. Nyaung U has a small airport. There are daily direct flights to and from Yangon, Mandalay, and Heho (Inle Lake). Your best bet is to book flights locally, which generally isn’t a problem even at short notice. Most of the hotels can book flights for you or at least recommend a travel agent where you can book your flight. Domestic flights usually cost around 100 dollars, sometimes more, sometimes less. The taxi ride from the airport to Nyaung U costs about 5,000 kyat, more if you need to go to New Bagan or Old Bagan. Bagan is connected to all major destinations in Myanmar by bus. There are daily direct buses to and from Yangon (10 hours), Nyaung Shwe near Inle Lake (8 hours) and Mandalay (5 hours). You can chose between day and night buses. We recommend booking one of the comfortable VIP buses that are available on all the major routes. These buses have two seats on one side and only one on the other and are very comfortable. And they usually only cost a couple of euros more than the other buses. You can buy bus tickets at most hotels and travel agencies. Because of their seating plan, VIP buses are often referred to as ‘2+1 buses’. Tickets prices range between 8,000 kyat (Mandalay) and 20,000 kyat (Yangon) depending on the distance and level of comfort. Getting to Nyaung U from the bus station costs about 3,000 kyat per person. Getting to New Bagan and Old Bagan is more expensive. 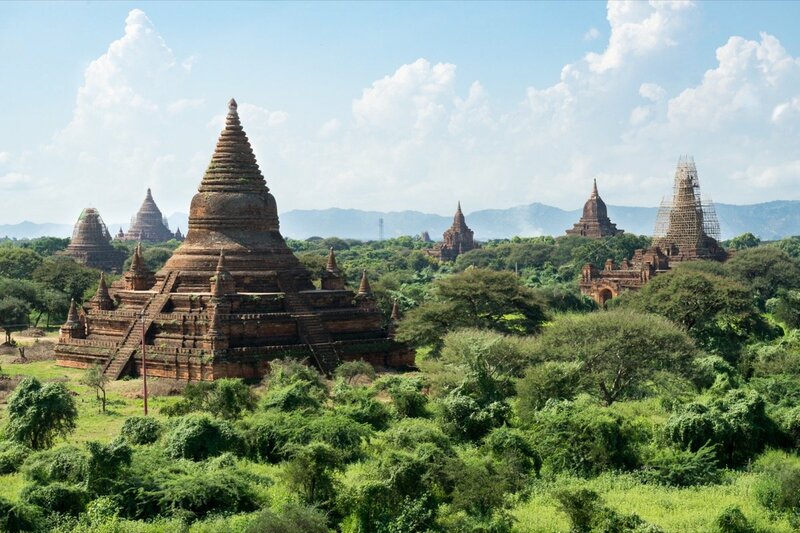 If you’re feeling a bit adventurous, you can also go to Bagan by train. There are daily connections to and from Mandalay (8 hours) and Yangon (17 hours). But delays of several hours are annoyingly common and so those 17 hours can quickly turn into 22 hours. 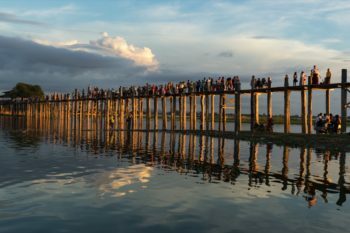 A train ride in Myanmar is definitely an experience. But we’d recommend opting for a shorter trip because it’s really, really uncomfortable, even in the upper class. 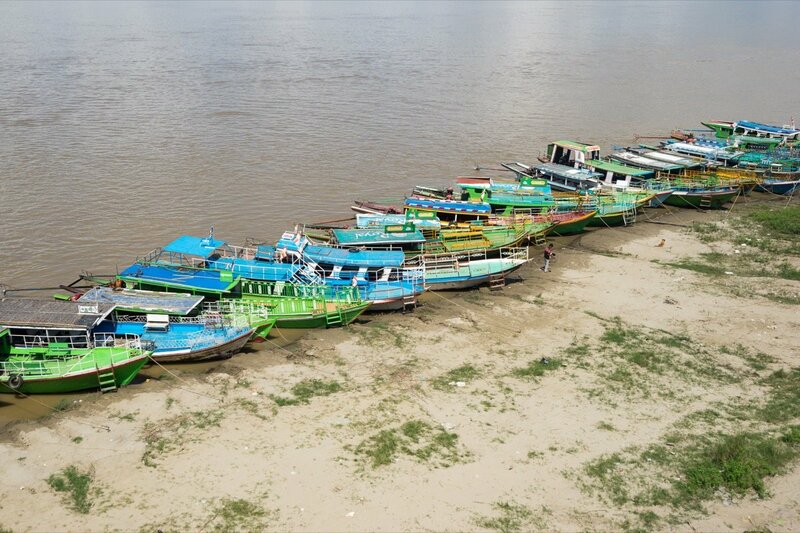 For your outward journey, there are boat cruises heading up the Irrawaddy River from Bagan to Mandalay. The trip takes up to 13 hours or 9 hours in the opposite, downriver direction. Several boats go this route every day. But to be honest, it wasn’t the most scenic journey we’ve ever been on. If you want a real experience, you can go on a river cruise with a replica of a colonial-era boat. We went on a two-day tour with Pandaw Cruises and stopped off in several places along the way. The experience comes with a price tag attached, but it’s definitely worth it. 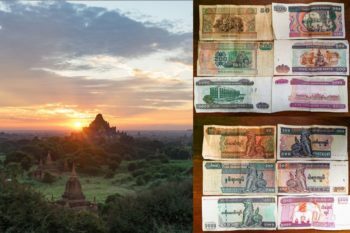 You have to pay an admission fee of 25,000 kyat (about 20 euros) to visit Bagan. If you’re traveling to Bagan by bus or plane, you’ll probably have to buy the ticket directly upon arrival. Otherwise, tickets are checked at some of the larger temples. For example, we were checked at the Shwesandaw Pagoda at sunrise and at the Htilominlo Temple. Tickets are valid for 5 days and you should always have yours on you in case you get checked. You should dress appropriately in Bagan just as you would for any other temple in Myanmar. That means: T-shirts should cover the shoulders and pants should go below the knee line. You have to take off your shoes and socks before entering any of the temples. So you’re probably best off wearing flip-flops or sandals if you don’t want to spend the whole day getting in and out of your shoes. 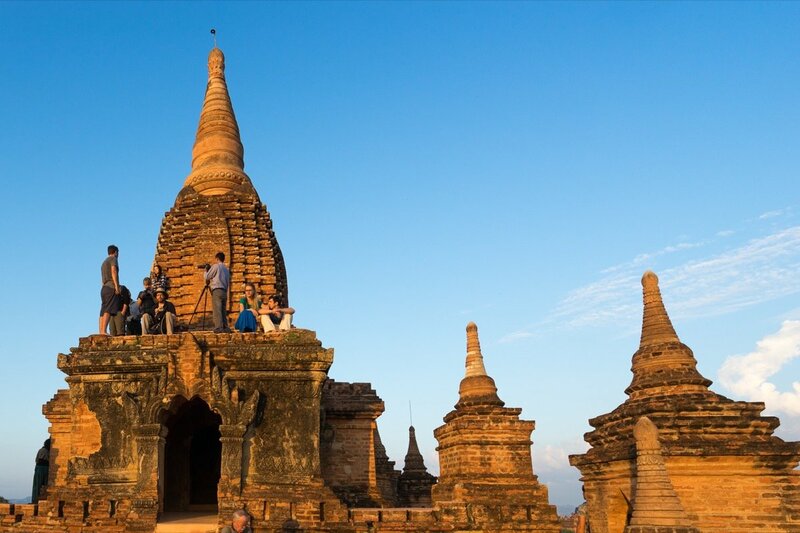 Bagan also attracts a great many locals who hold all the temples and pagodas sacred. When people kneel before the Buddha statues, you should stand back and not try to move in between them. Also, you should always think twice before climbing up somewhere just to take that special photo. The temples are up to 1,000 years old and weren’t built for photographers to climb around on them. After all, there are plenty of temples that you’re allowed to climb. This should all go without saying really, but unfortunately we encountered way too many tourists who couldn’t even stick to these simple rules. We can’t say for sure if this was down to ignorance or indifference. At least ignorance can be cured by information, which is why we wrote this paragraph. Unfortunately, there’s nothing we can do about indifference. 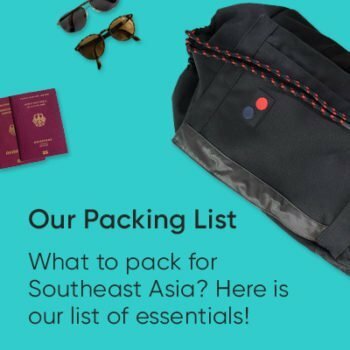 Do you have any travel tips for Bagan? Bagan was definitely an absolute highlight of our Myanmar trip. We really really enjoyed it and we’ll definitely return one day. Have you ever been to Bagan? 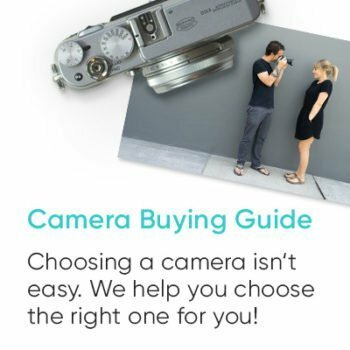 Perhaps you have an ultimate insider tip for us? A hidden temple or a great place to watch the sunrise or sunset? We’re looking forward to your comment. 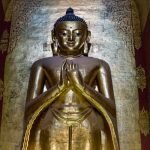 Oh, really detailed guide of travelling in Burma. I think this piece of writing is very useful for those who visit this country for the first time like me. Thanks for your sharing!